I don't have any pictures from making it, but it's so simple you don't need them. Take the 2x4 and coat it with glue or Modge Podge. Coat the outside with glue, too. I like the nice, slightly shiny finish the glue gives, it protects the fabric from jelly-covered fingers, and fabric just looks different when the glue soaks through, so this way those spots blend in. While that's drying, take apart the clothespins. You'll probably want to drill small holes (to fit the nails) into the clothespins so that they don't split when you hammer the nails in. 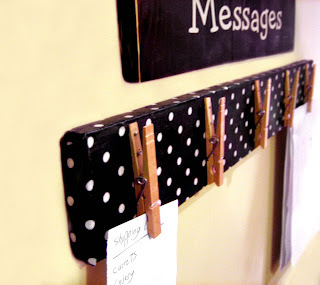 Position the clothespins where you want them to be and nail them in place. I used two nails per clothespin so that they couldn't spin around to random angles. Put the clothespins back together. Now you're done! That was easy. Now mine is hung up in my almost-finished kitchen. Hurray! I saw this referenced on another blog. I'm going to use the idea for my appointments. Thanks!! I LOVE this!! I wanna do it!! P.S. your dry erase calendar turned out great too! New Kitchen Cabinets = Playhouse for Hailey! I found out about this great blog today. Free Valentine's Day Card Templates!